Wouldn't it be nice to be able to travel back in time ? Most people don't realize that the 1968 Shelbys were only built for nine months. Cars destined for A.O. 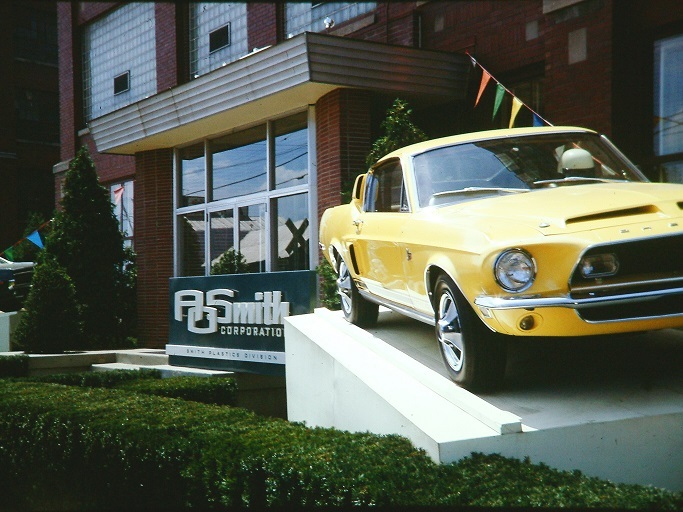 Smith didn't leave the Ford plant until December of 1967 and the last cars were shipped the first week in August of 1968. The conversion process continued into the fall of 1968. The GT500KRs (Production Total of 1571) had only a three month run- May, June and July of 1968. Most of these pictures were taken by Jack Reddeker on an A.O. 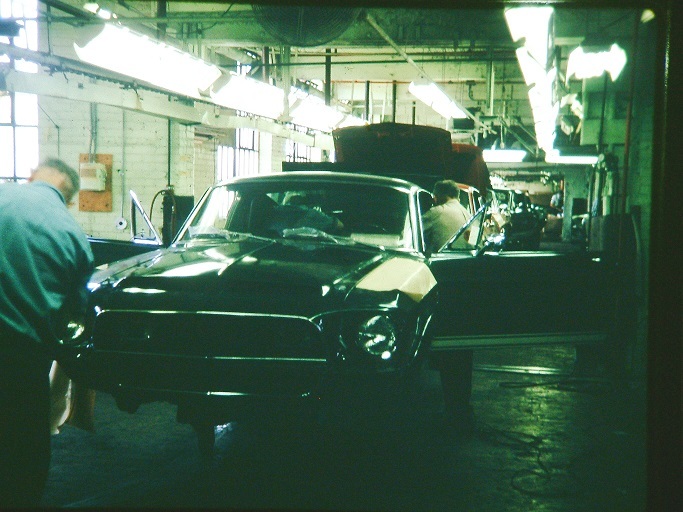 Smith plant tour in 1968. Many of the other pictures have only recently been discovered. 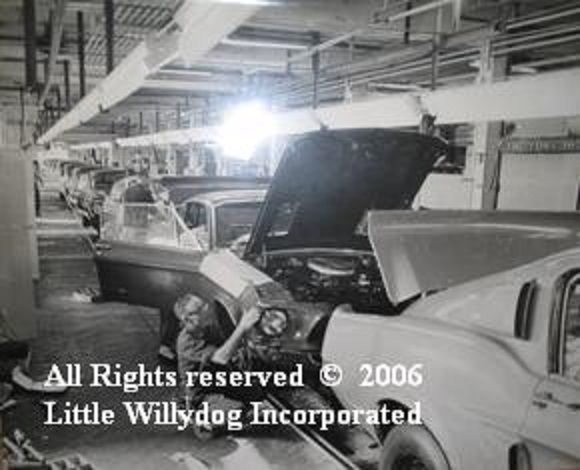 The new pictures were found by Shelby researcher, Keith Schadoff and are stamped "Little Willydog Inc". This GT500KR is half of AO Smith's display. The other half was a Cougar XR-7G. The XR-7Gs were also built by AO Smith. Shelbys started out as "knockdown" versions of 1968 Mustangs. 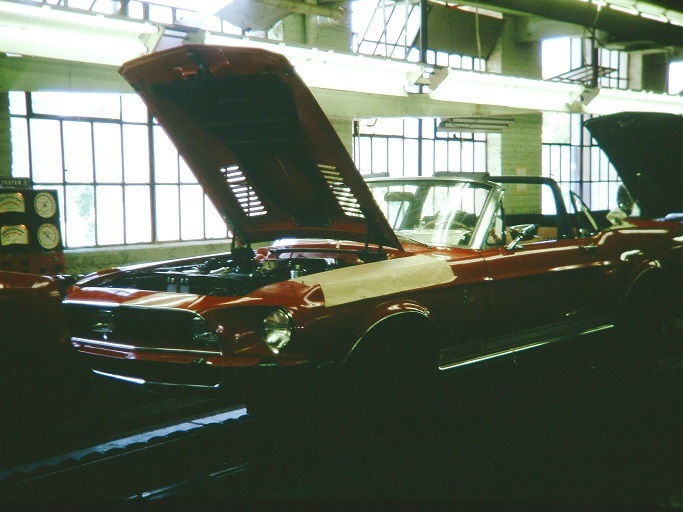 All cars destined for conversion were built at Ford's Metuchen, New Jersey assembly plant. The cars were shipped on rail carriers to A.O. Smith in Ionia, Michigan. 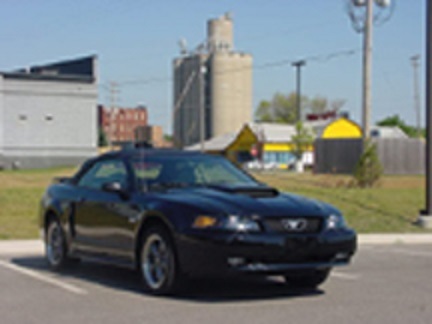 Some cars had unfinished fiberglass hoods and others had stock Mustang hoods. Many of these hoods would be reused multiple times. All of the cars were capable of running and driving when delivered. The summer of 1968. 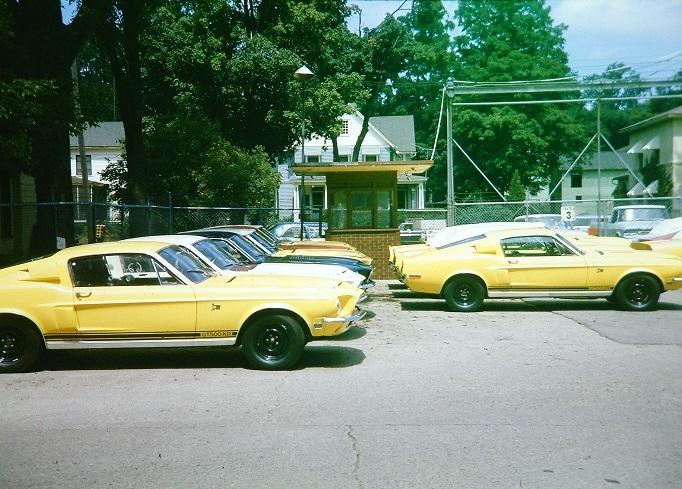 These photos show "knockdown" Mustangs waiting to be converted into Shelbys. You may notice that all cars have steel wheels. Also noticeable are the absence of front grille assemblies, tail lights and valences. These parts would not be needed by A.O. Smith. 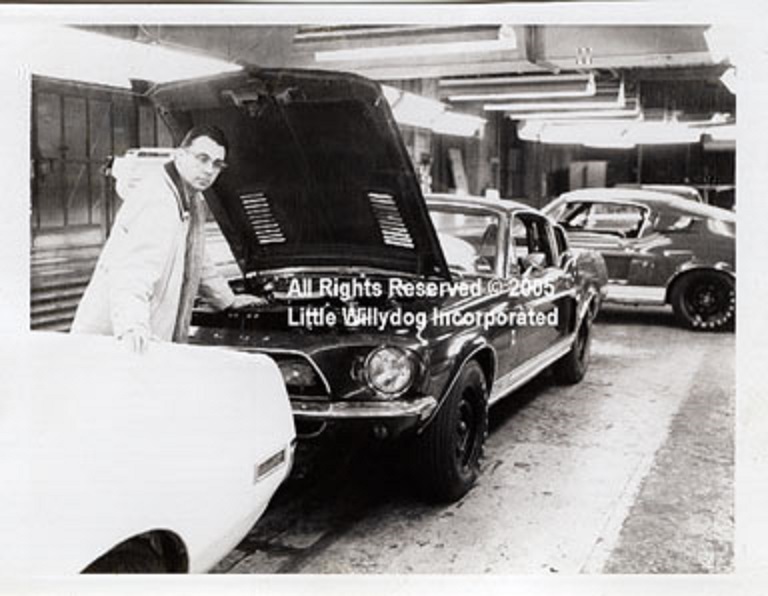 Once the cars arrived, they were inspected. Workers looked for mechanical defects, checked the fluids and inspected the finishes. If there were any problems a note was made at this time. Once inside, each car would go through a series of "stations". 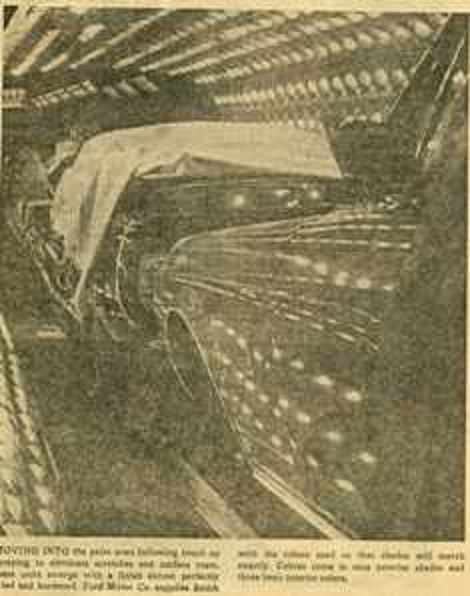 At the first station, workers removed production parts to facilitate the conversion. Seats and carpets were removed, as were interior trim panels. Batteries were disconnected. Every car had a roll bar welded in and the rear taillight panels were modified to accept the new sequential lights. Further modifications to the body were made on cars with air conditioning. 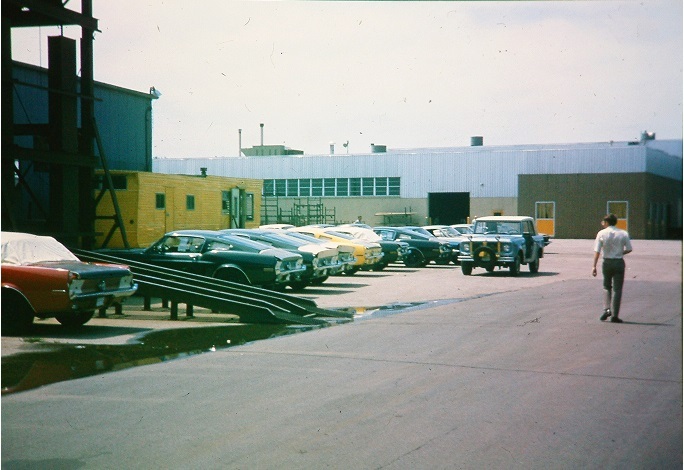 These cars were prepared to receive special oil coolers. I believe the gray fixture in the photo is actually an elevator. The elevator was used to move cars between floors of the multi-level facility. There seems to be some truth to the stories that at least one car actually fell off the elevator. Under the hood, stock air cleaners were removed and set aside. The oil pressure wiring was modified for the Stewart Warner gauges. Cobra valve covers were installed. In the front, special bumper extensions were added. New fiberglass headlight buckets, valences and hoods were also added. In the rear, fiberglass decklids and end caps were installed. 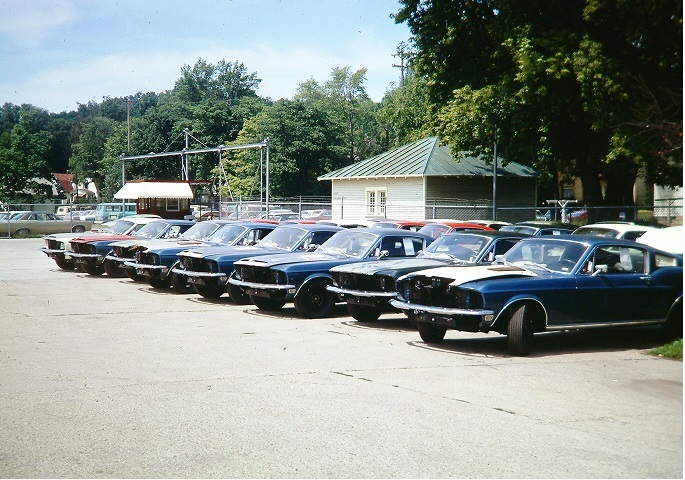 Each car was assigned a special serial number. The numbers were recorded and a special Vehicle Identification Number was installed. Side scoops were added and fastback cars also received upper air extractors. Early cars received Marchal fog lights, later cars Lucas lights. There were several variations to wire these lights throughout the year. New "Shelby Cobra" seatbelts were installed inside the car. Each car also received a unique console. Under the dash, new flasher assemblies had to be installed to make the taillights flash correctly. Interior panels were reassembled. Every car received a set of rocker panel stripes. These stripes came in three colors blue, white and black. Each set matched an exterior color and the model designation. In the beginning, there were GT350s and GT500s. In May of 1968, a new Shelby model appeared...The GT500KR. 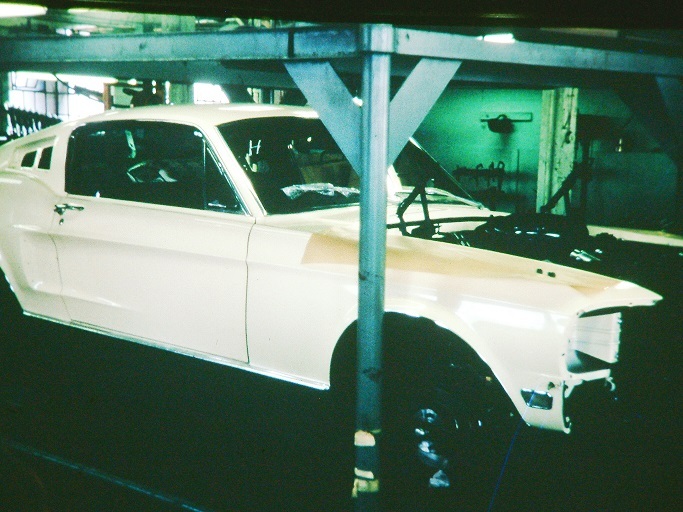 Fiberglass parts were painted to match the original Mustang colors. Heat lamps were used to assist the drying process. 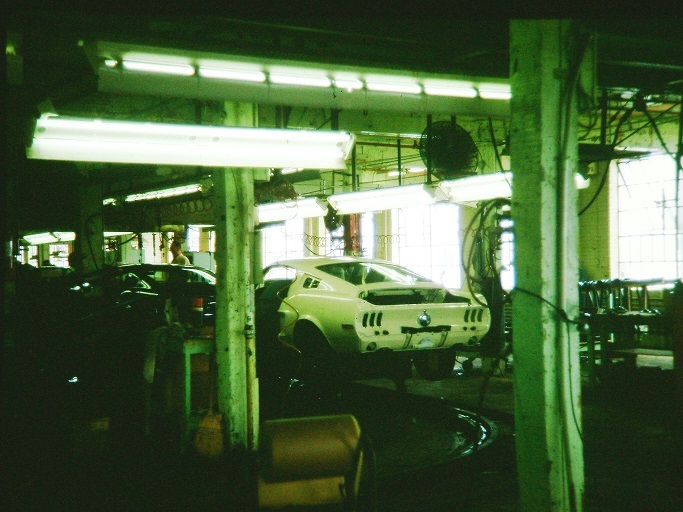 One photograph shows a green car drying and also clearly shows the correct emblem placement for a GT500KR. 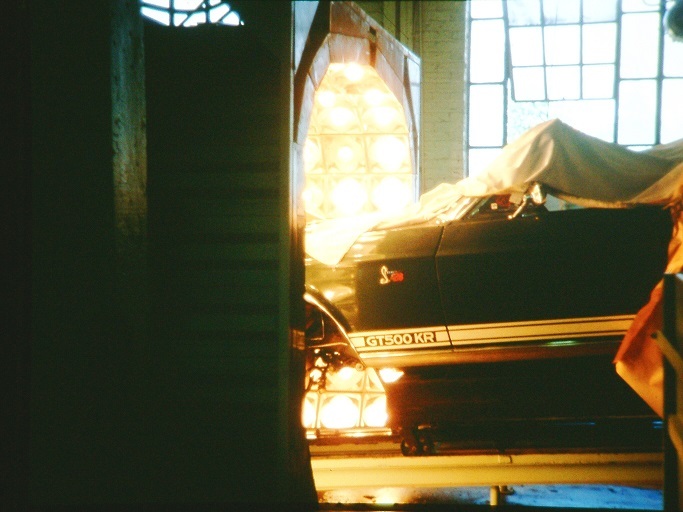 A worker massages the fiberglass, headlight bucket on the production line. If you have installed one on a finished car, you know it is no easy task. 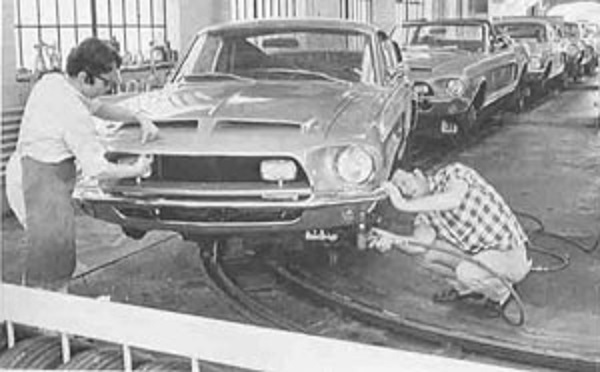 Jean Ross (left) and Dewey Perkins (right) put the finishing touches on a 1968 Shelby fastback. Photo courtesy of the Shelby American Automobile Club. The cars were reinspected, codes checked and body tolerances were checked. Here Lynn Griffin inspects a finished car. Decals and owner's manuals were placed in their proper locations. A front license plate bracket was also stowed in the glove box. 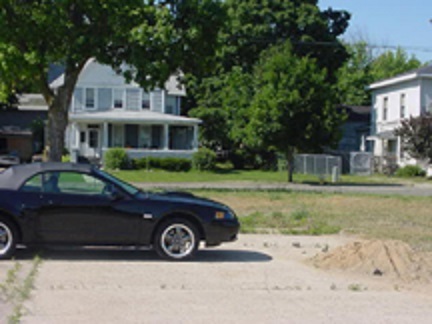 Antennas and a box of four new hubcaps were placed in the trunk of each car. Mr. Griffin spends some quality time with AO Smith's finest. Literally, only a handful of cars left the factory with factory ten spoke wheels (less than five). The finished Shelbys were sent to dealers nationwide. Because dealers installed antennas, we see many variations in their mounting locations. You can date this photo from the large lettered, Goodyear tires. It is most likely January or February of 1968. 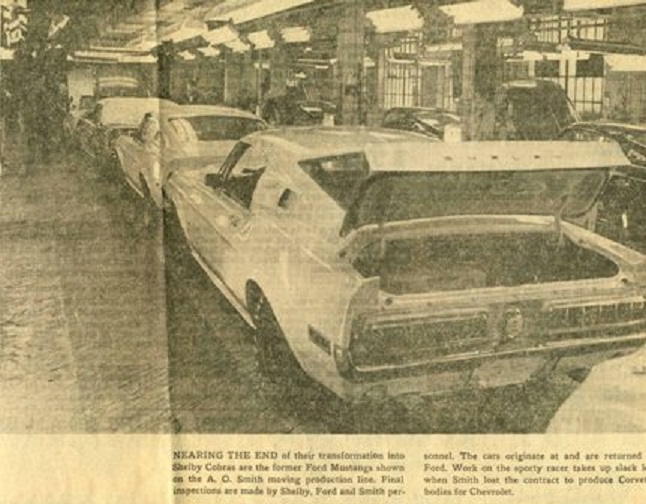 This picture of the assembly line is from a Michigan newspaper, vintage 1968. 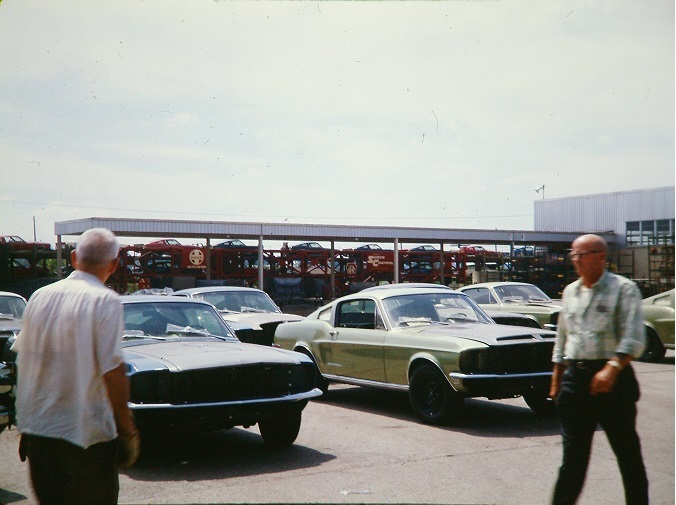 The caption read, " Nearing the end of their transformation into Shelby Cobras are the former Ford Mustangs shown on the AO Smith moving production line. 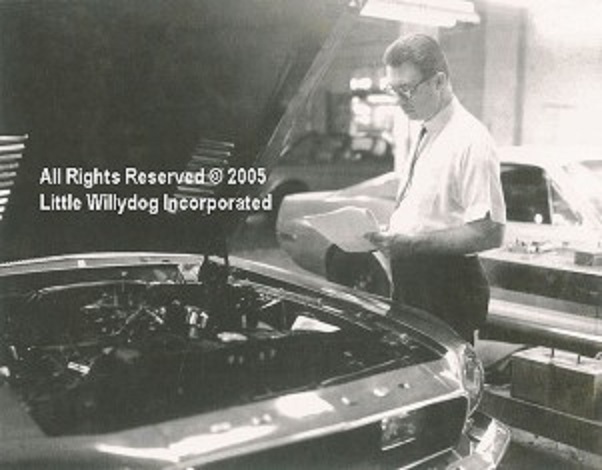 Final inspections are made by Shelby, Ford and Smith personnel. " 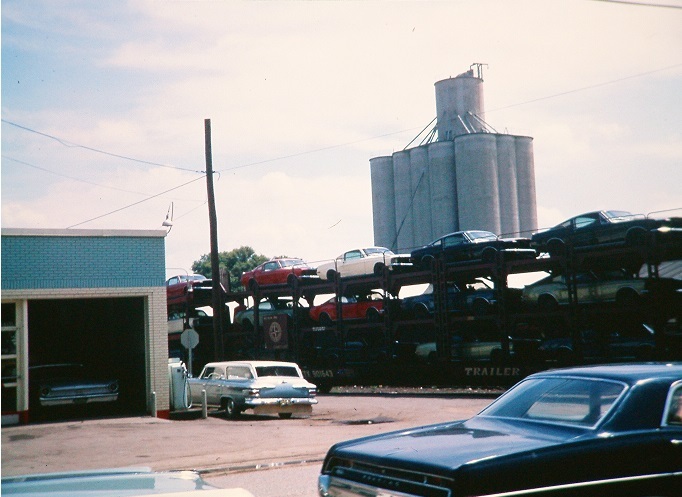 Here finished cars wait in the yard for shipment to Shelby dealers. These yellow GT500KRs are rare. How rare? Check out the special paint link on the Home page. These pictures were sent to me by Chris Richardson. Chris went back to Ionia and found the location of the old plant. The nearby grain elevators are still standing and the houses haven't changed too much. Compare them with the ones above. Thanks Chris.